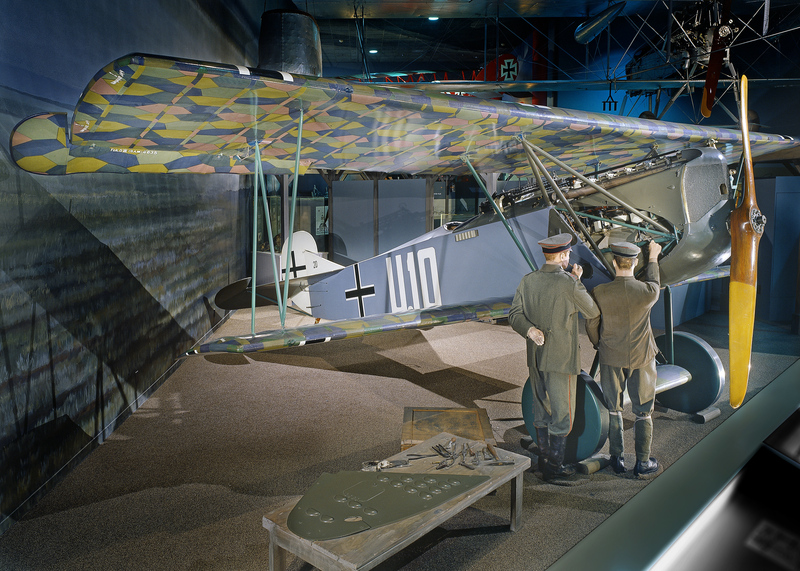 A Fokker D.VII on display in the Legend, Memory and the Great War In The Air gallery at the National Mall building. When the Fokker D.VII appeared on the Western Front in April 1918, Allied pilots at first underestimated the new fighter because of its squarish, ungainly appearance, but quickly revised their view. The D.VII's unique ability to seemingly "hang on its propeller," and fire into the unprotected underside of enemy aircraft made it a highly feared combat opponent. The Armistice agreement requirement specifically demanding that all Fokker D.VIIs be immediately surrendered attested to the general high regard for the airplane. In response to the loss of air superiority in late 1917, the Germans organized a competition for new fighter designs held in January 1918. The in-line engine winner was the Fokker D.VII. This object is not on display at the National Air and Space Museum. It is either on loan or in storage. In response to the loss of air superiority in late 1917, the Germans organized a competition for new fighter designs held in January 1918. The in-line engine winner was the Fokker D.VII. Fokker received an order for 400 aircraft. To meet the demand for the new fighter, Albatros, Fokker's chief competitor, also built the D.VII under license. Ironically, Albatros built more D.VIIs than the primary contractor and the Albatros product was of higher quality. The Fokker D.VII in the NASM collection was built by Albatros. The German Fokker D.VII is frequently cited as one of the best fighter aircraft of the First World War. The well-known requirement articulated in the Armistice agreement ending the war, that specifically demanded that all Fokker D.VII aircraft should immediately be surrendered, succinctly attests to the general high regard for the airplane. During the latter half of 1917, the Allies had regained air superiority over the Western Front with the S.E. 5 and the Spad fighters. To counter this, the German government invited aircraft manufacturers to submit prototype single-seat fighter designs for evaluation at a competition to be held at Adlershof airfield in Berlin in January 1918. The aircraft would be demonstrated by the manufacturers, and would be tested by front-line combat pilots. The design with the best overall performance would be awarded a production contract. Thirty-one airplanes from ten manufacturers were evaluated for such qualities as speed, maneuverability, diving ability, pilot's view, climbing rate, performance at high altitude, etc. One rotary-engined and one in-line-engined design were selected. The winner in each category was a biplane offered by the Dutch-born aircraft manufacturer, Anthony Fokker. The rotary-engined design was the Fokker V.13, which was produced in small numbers under the military designation Fokker D.VI. Because the hoped-for higher horsepower rotary engines intended for use in the Fokker D.VI were not available soon enough, the airplane had to be fitted with an older, lower-horsepower engine, which rendered performance below combat standards. The Fokker D.VI saw little operational service and was relegated to home defense and training roles. Far more successful was the in-line-engined winner of the Adlershof competition, the Fokker V.11, which became the Fokker D.VII as a production airplane. The V.11 was largely the creation of Fokker's chief designer, Reinhold Platz. Platz was the true creative force behind the famous Fokker fighters of the second half of the war. He did most of the fundamental design work on the firm's aircraft after 1916. Anthony Fokker's talents were greater as a test pilot than as a designer. He had an innate ability to fly an experimental aircraft and know just what improvements needed to be made to turn it into a successful performer. This intuitive sense on the part of Fokker, combined with Platz's innovative preliminary designs, made them a formidable team. Fokker's ego and dominating personality frequently led him to understate Platz's role as the genuine innovator of the designs that bore the Fokker name, and he took undue credit for himself. Nevertheless, there is no denying the important contributions Fokker made to bringing Platz's designs to final form. This was especially true in the case of the Fokker D.VII. The Fokker D.VII prototype, the V.11, was completed just before the Adlershof competition began on January 21, 1918, so Fokker had little time to test it beforehand. On January 23, famed German ace, Manfred von Richthofen, the Red Baron, flew the V.11 at Fokker's request. Richthofen thought the airplane was maneuverable and had generally good performance, but that it was tricky to handle and directionally unstable, especially in a dive. Ritchhofen's assessment confirmed Fokker's own impression of the V.11 from his brief testing of the airplane before the competition began. To remedy these problems, Fokker lengthened the fuselage 40 cm (16 in), added a fixed vertical fin and a new rudder shape, and altered the aileron balances, among other small changes. With these modifications, the V.11 was safe and pleasant to fly, and had lost little of the maneuverability that had initially impressed von Richthofen. The Red Baron flew the improved V.11 and now found the airplane delightful to handle. He urged other pilots at the competition to try it, and they also thought the design was very promising. Given his stature, the endorsement of von Richthofen went far towards the selection of the V.11 as the winner of the competition. The trials of the V.11 at Adlershof showed Anthony Fokker at his best. His instinctive sense of precisely how to quickly modify the V.11 to transform it from a merely acceptable airplane into a winning design illustrated his genius for incorporating flight test results into design. Moreover, Fokker understood better than any of his competitors that overall performance was more important in a fighter aircraft than exceptional performance in one or two areas, such as speed or climb rate. Other aircraft at Adlershof were better than the V.11 in individual performance parameters. But none surpassed it as a fighter design in the complete sense, regarding not only overall performance but also structural and production concerns. Upon winning the Adlershof competition, Fokker received a production order for 400 Fokker D.VIIs. Concerned that the Fokker factory would be unable to meet the demand for the new fighter, IdFlieg (Inspektion der fliegertruppen), directed Albatros, (Fokker's great rival) to produce D.VIIs under license. Albatros built the Fokker D.VII at both its Johannisthal and Schneidemühl factories, known as Albatros-Werke G.m.b.H. and Osdeutsche Albatros Werke respectively. The Johannisthal-built aircraft carried the designation Fokker D.VII (Alb) and those constructed at Schneidemühl were identified Fokker D.VII (O.A.W.). Because the Fokker factory produced no construction drawings, working only from jigs and assembly sketches, Albatros had to make its own drawings, based on a completed airframe obtained from Fokker. This, in addition to each firm applying its own construction techniques and standards, resulted in Fokker D.VIIs that looked alike, but differed in detail. Thus, not all components were interchangeable on airplanes built at the three factories. Moreover, the aircraft built by Albatros were generally considered to be of higher quality than those produced by the primary contractor, Fokker. Interestingly, more Fokker D.VIIs were produced by Albatros than by Fokker, with a total for all three factories of approximately 1,000 aircraft. Fokker D.VIIs began to reach front line units in April 1918. Initially, the D.VII was powered by a 160-horsepower Mercedes D.III engine. By the summer, however, the Mercedes-powered D.VII was already having difficulty keeping pace with the latest Allied fighters. The airplane was then experimentally fitted with the new 185-horsepower B.M.W. IIIa, which dramatically improved performance. Unfortunately, only limited quantities of the B.M.W. IIIa were available. The B.M.W.-powered model, known as the D.VIIF, was much sought after by the German pilots, but could only be supplied in small numbers. When the Fokker D.VII appeared on the Western Front, Allied pilots at first underestimated the new fighter because it lacked the sleek, graceful lines of the German Albatros fighters. But they soon revised their view, despite the comparatively ungainly appearance of the D.VII. One reason for this was the soon-to-be-famous ability of the Fokker D.VII to seemingly "hang on its propeller," and fire into the unprotected underside of Allied two-seater reconnaissance aircraft. The Fokker D.VII's thick wing section endowed the airplane with good stall characteristics. Positioning below and behind a two-seater, where the enemy observer could not bring his guns to bear, a D.VII pilot could safely put his airplane into a nose-high attitude, with full power, in a nearly stalled condition. The capability of the D.VII to perform this maneuver made it a highly feared opponent in combat. Many experimental variants of the Fokker D.VII were developed during the remaining months of the war, mostly employing different engine installations. But none reached production status. A two-seat version was designated the Fokker C.I, but it was never officially adopted by the German Air Service. Of the 220 aircraft that Fokker smuggled out of Germany to his native Holland at the end of the war, 120 were Fokker D.VIIs and 60 were Fokker C.Is. The Fokker D.VII in the NASM collection is an Albatros-built example, produced at Schneidemühl. At the time of its capture, it was assigned to Jasta 65. On November 9, 1918, two days before the end of the war, Lieutenant Heinz Freiherr von Beaulieu-Marconnay landed the NASM Fokker D.VII at a forward American airfield being used by the 95th Aero Squadron, near Verdun. The pilot and airplane were captured by three American officers before Beaulieu-Marconnay could set fire to his aircraft. It is uncertain whether or not Beaulieu-Marconnay was lost and mistakenly landed at what he thought was a German airfield (as he claimed), or simply surrendered, knowing that the war would soon be over and fabricated the story. The Fokker D.VII was brought to the United States after the war and given to the Smithsonian Institution by the War Department in 1920. The airplane was fully restored by NASM in 1961. Further minor work was done on the D.VII in 1991 to prepare it for the museum's new World War I exhibition, Legend, Memory, and the Great War in the Air. Overall diameter approximately 110 in. Hub diameter approximately 9 in. Single-engine, single-seat, German World War I biplane fighter; 160-horsepower Mercedes D.IIIa water-cooled engine. Lozenge camouflage on wings. Fuselage gray and olive drab.